RBHS performed at the Lafayette Contest of Champions this past Saturday, September 23rd. After a great finals performance, students were awarded a first-place finish in finals among some great bands. RBHS took home a traveling trophy which dates back through the late 80s. 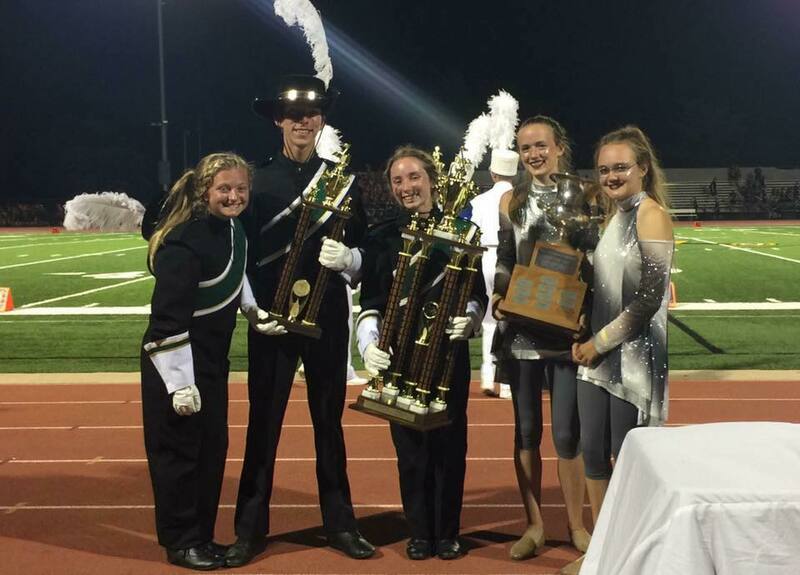 In finals, RBHS earned best music; 2nd in visual and 3rd in general effect. Congrats to the entire team on a very well designed show and a well-executed show. RBHS will be traveling to Tulsa, OK for a festival at Owasso High School on Saturday, September 30th. Isabella Shah attended the Fine Arts Explorers experience this past summer and had an excellent time. One of her projects she completed was to make art inspired by this years eclipse. It made such a big impact that Isabella made a bunch at home to sell yesterday in front of her home during the eclipse. And Joel Sager from the Sager Braudis gallery of downtown Columbia is purchasing a piece of her work. Congratulations to Isabella for her outstanding work! The Boone County Weavers and Spinners Guild held its opening reception for their Student Fiber Arts Show yesterday. All Battle High School Fiber students were given the opportunity to submit artwork. Exciting results for State Large Ensemble and District Solo & Ensemble for Rock Bridge High School. Students did a phenomenal job with a total of 36 solo & ensemble entries to State. That is the most ever for RBHS Bands! For the first time the third RBHS band (Concert Band) performed at State and received a ‘2’ rating. Additionally RBHS has never entered a brass choir or woodwind choir to State Large Ensemble and the brass ensemble received a ‘1’ and the woodwind ensemble received a ‘2’. Fantastic for these first-ever entries. At NWSU, our jazz students had the opportunity to watch the Count Basie Orchestra perform. What an extra special treat to an already successful weekend for the jazz program. Recently Battle High School Art Students were successful at the Columbia Art League and Columbia College Art Shows. Marc Chauvin, Battle senior, was juried into a professional exhibit at the Columbia Art League and won an award for his work! The whole jury process is an important one for artists to learn to manage, both logistically and emotionally. Columbia Collage had their 12th annual high school show and competition. In addition to three BHS students being featured on the exhibit poster, six students won cash awards. Additionally, BHS students swept the photography category, taking 1st, 2nd, and 3rd Place. Congratulations to Sarah Meadows, she has won 3rd Place in the Senior Division of the Creating Original Music Project at the University of Missouri. In recognition of her fine musical achievement, she will be awarded $500. Her school will also receive $500. All are invited to attend the Creating Original Music Project Festival on April 16th at the University of Missouri. Sarah's piece will be performed in the Senior Division Recital at 2:30 PM, which will feature pieces by first-, second-, and third-place winning composers in grades 9-12, followed by an awards ceremony. Parking will be available in the Hitt Street Garage and the University Avenue Garage on the University of Missouri Campus. Josh, Lily, and Secunda all qualify for the NATIONAL NSDA Tournament and will compete this summer in Salt Lake City. The Rock Bridge bands had a fantastic number of students make the Northeast District Missouri Honor Band, Honorable Mention Band, and the Honor Jazz Band. Thirty-Four students auditioned with 29 making one or more of the bands. All-State auditions is on December 5 and the far majority of these students qualify for auditioning at the next level. Megan Fudge and Carter Moore submitted recorded auditions for the Honors Choirs of the Southwestern Division of the American Choral Directors Association. Megan was selected to sing in the Freshman and Sophomore Women's Choir and Carter was selected to sing in the Junior and Senior Mixed Choir. They will perform with these ensembles at the SWACDA conference in Kansas City on March 10, 2016. Hickman High School was well represented on Saturday with nine students having earned the right to sing in the Missouri Northeast All-District Choir after their audition in September. Alexandra Jaberg sang in the Freshman/Sophomore Choir and Lydia Bryda, Sophia Casto, Josh Friedrich, Mikey Mossine, Carter Moore, Katie Peterson, Stella Pruitt and Margaret Straw sang in the Junior/Senior Choir. The Juniors and Seniors then auditioned for the honor of being selected to join the best singers in the state as members of the Missouri All State Choir. Hickman has three of the 20 Students chosen from the Northeast District. Josh Friedrich, Mikey Mossine and Stella Pruitt will spend three days in January rehearsing and performing with the All State Choir at the Missouri Music Educators Convention at the Lake of the Ozarks.